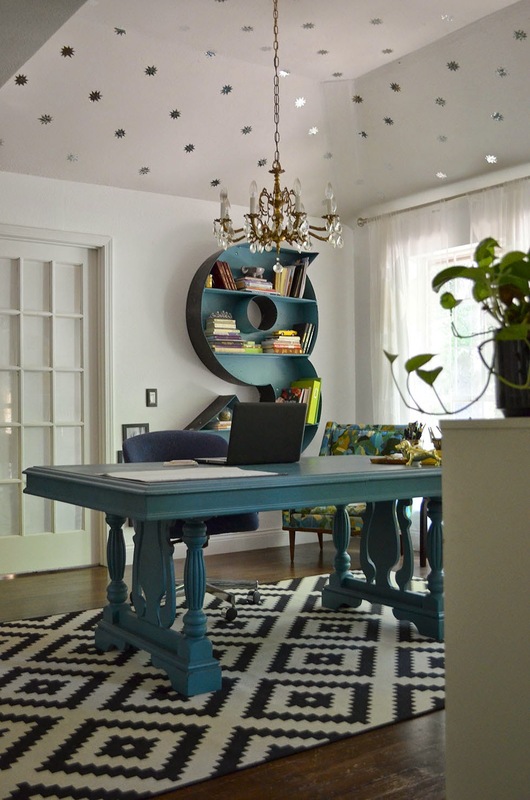 The Happy Homebodies: Reveal: Home Office Makeover! 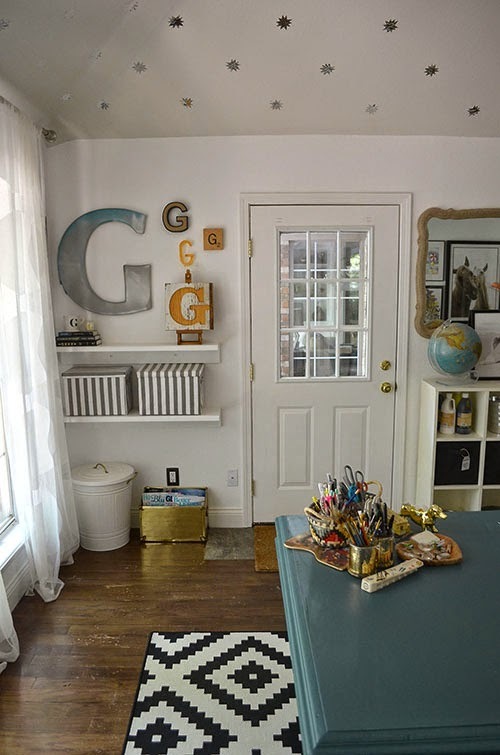 One of the things that excited me so much about this home when we bought it was that I could use this room the previous owners were using as a playroom as my home office/art studio. The husband agreed that I could have this room all to myself, so I was able to make it as feminine and "me" as I wanted without considering his masculine sensibilities. I finally finished it this weekend, and it is now one of my very favorite places in the house. Let's start at the beginning! Here how this room looked when we toured the house. 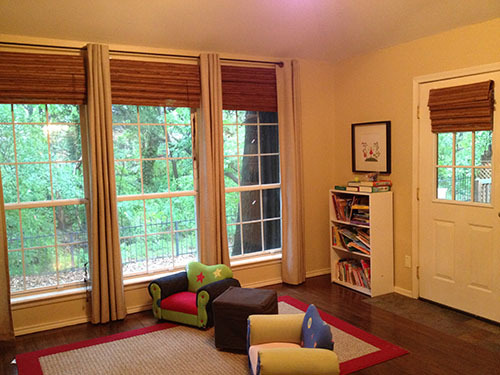 The previous owners had twin daughters and used this as a playroom. It's located right in the middle of the house, adjacent to the formal living room and kitchen. It has a door that leads to our back deck and another that leads into a guest room. 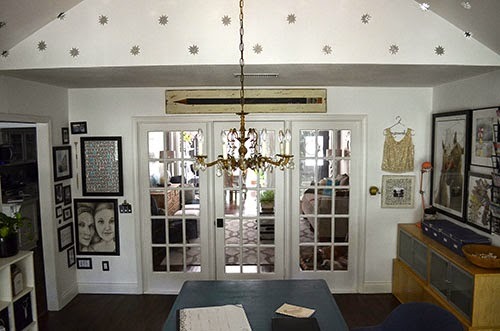 This room has four different entrances, so it's a major connecting point of the house. We painted some rooms before we even moved into the house, including this one. I wanted it to be bright and fresh so that I could have a gallery look when I hung my artwork, so I went with Chantilly Lace by Benjamin Moore. 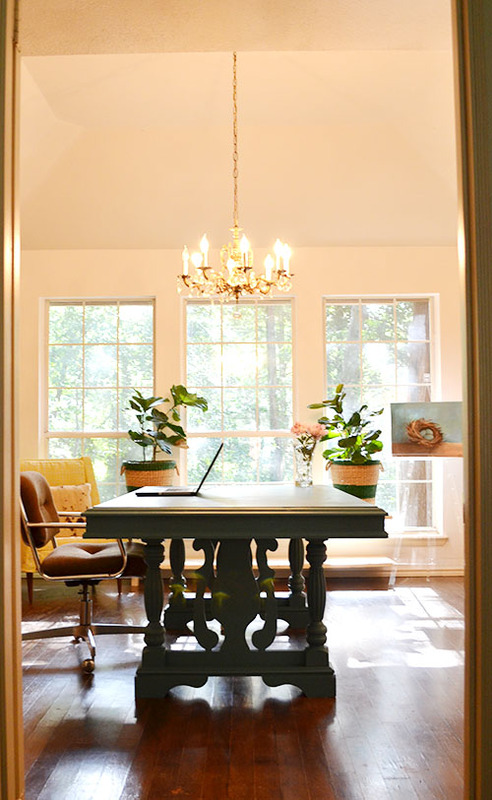 We hung a thrift store chandelier and painted my old dining table to use as a desk, and that was how the room looked for more than a year while we worked on other parts of the house. I finally got the motivational push I needed about six weeks ago when I was chosen by Leviton to participate in the Renu Challenge, a room makeover competition featuring 20 designers, bloggers and regular home owners. 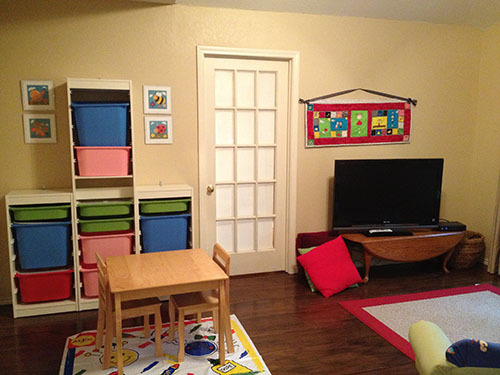 The challenge was to incorporate the Leviton Renu line (really fancy light switches and plugs that come in a rainbow of color combinations) into a room makeover. This is my first blogging competition, and it was a little bit intimidating because I looked at my competitors and noticed many are professional interior designers and most are way more "popular" than me and this little ol' blog. I mean, they actually have Twitter followers! I'm still trying to reach 125 Twitter followers over here. But I decided to just stay true to my decorating style (low budget with a lot of DIY flair) and do my very best. I really did not want to embarrass myself, so I worked very hard to make this room into a space I that makes me proud. This room is SO me. It's a lot more bold, quirky and creative than the rest of our house, and I did that on purpose. This is my work space, and I want to feel creatively stimulated when I'm in this room. While I try to make the rest of my home feel like a calm refuge from the world, I want this room to be exciting and energizing. Let's see some after pics, shall we?! When I was considering which color switches/light plates to choose for the challenge, and it was a unique proposition because I have never used anything other than a plain white light switch. (I've always tried to downplay the switches and plugs instead of making them part of my room design.) I could have chosen white, but I felt like the interesting part of the Renu line is the color selection and the mix/match feature, so I wanted to take advantage of those elements. 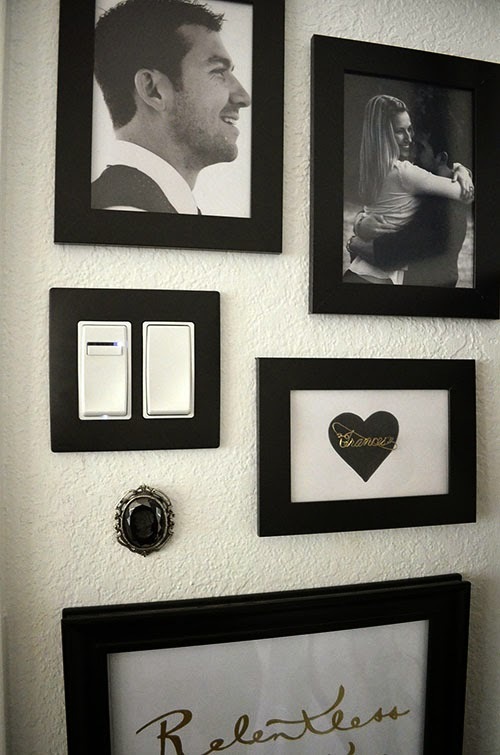 I provided a Q&A to their blog that explains why I chose black and white switches, but the main summary is that I was inspired to make the switches and plugs look like part of my gallery walls. I chose black frames and white switches to mimic the black frames and white mats I use to frame my artwork inside my home office/art studio. 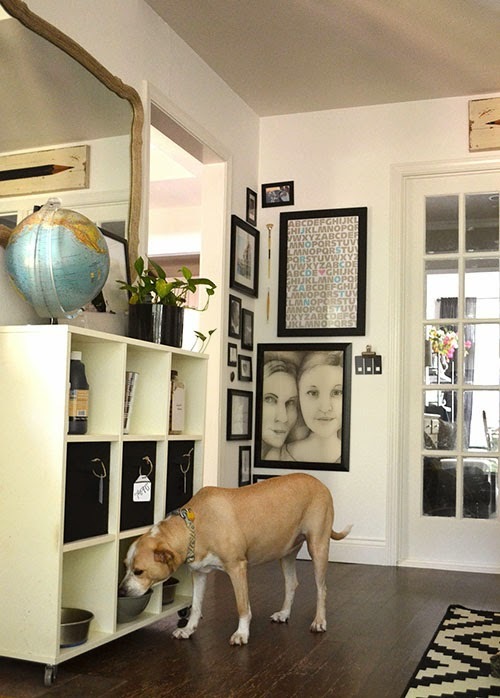 The gallery walls are a central element of this makeover. 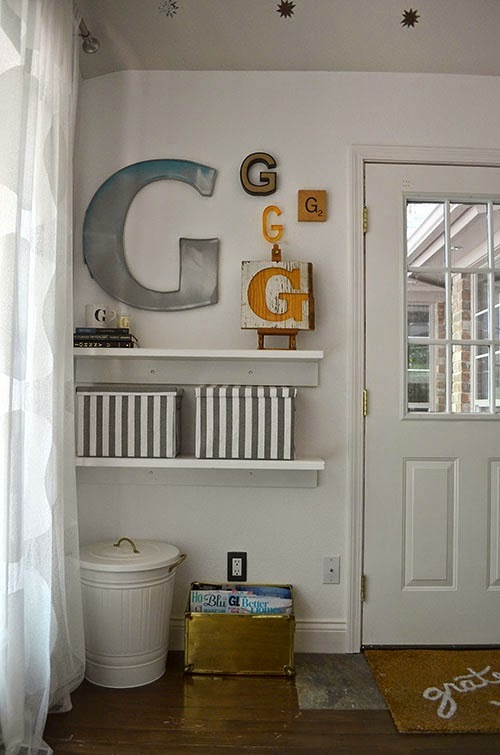 See how the corner gallery wraps from one wall to the other and blends perfectly with the light switch and plug? And then on the opposite wall, I did an unconventional gallery near my DIY letter bookshelf that also incorporates a switch and plug. 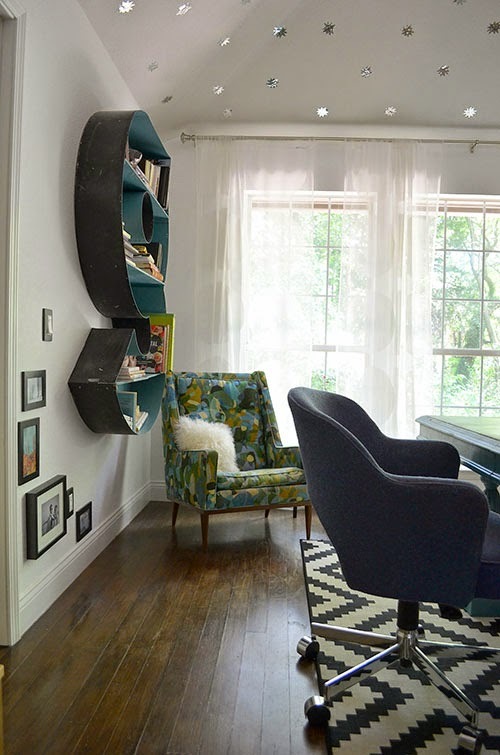 There's my $5 Milo Baughman chair, sitting so happily in the little reading corner. 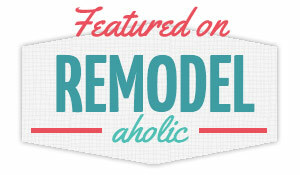 One of the few purchases I made for this makeover was the $100 Ikea Lappljung Ruta rug. It's so graphic, and it provides a perfect backdrop for the bright teal dining table I've had for 10+ years. 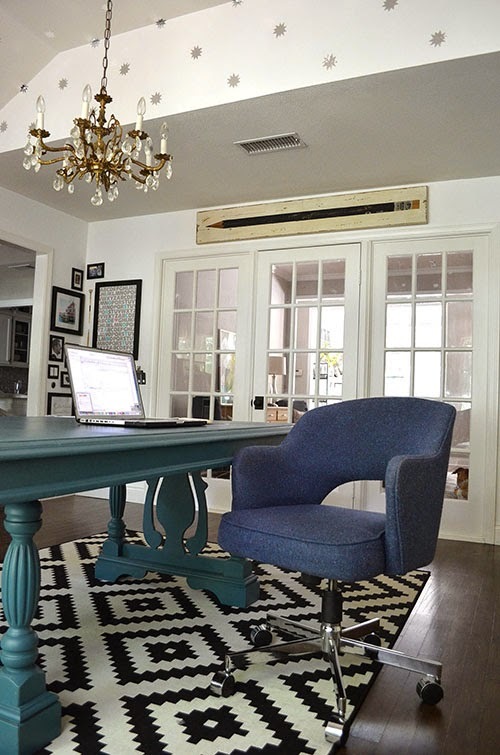 I've always wanted to buy that rug but never had the perfect space – until now! Did you notice the ceiling? I cut stars out of reflective silver contact paper (by hand!) and placed them on my ceiling one-by-one. Talk about tedious. Thank goodness it turned out to be one of my favorite design elements or I would be very bitter about how long that process took. At least it was a free project since I've had that contact paper sitting around for years now. 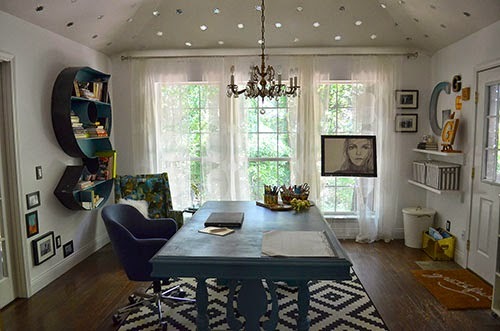 I love how the ceiling bounces around the light and enhances the interesting ceiling in this space. In the far corner, the husband repurposed a wooden bench we found in our attic (left by the previous owners) into floating shelves. I wanted more storage, but I didn't want to take up a lot of visual space. The floating shelves painted the same color as our walls were the perfect solution, and I love that we built them for free. We also spray painted the hardware on that Ikea Knodd trash bin gold to make it a little more special. It's actually filled with dog food, not trash. 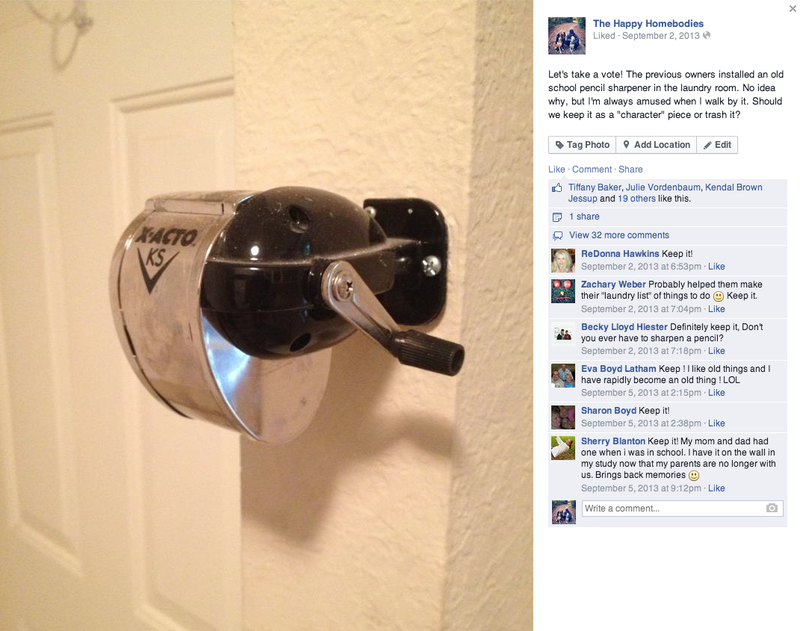 I asked on Facebook if I should keep the random pencil sharpener the previous owners left on the wall of the laundry room. Your answer? A resounding YES! 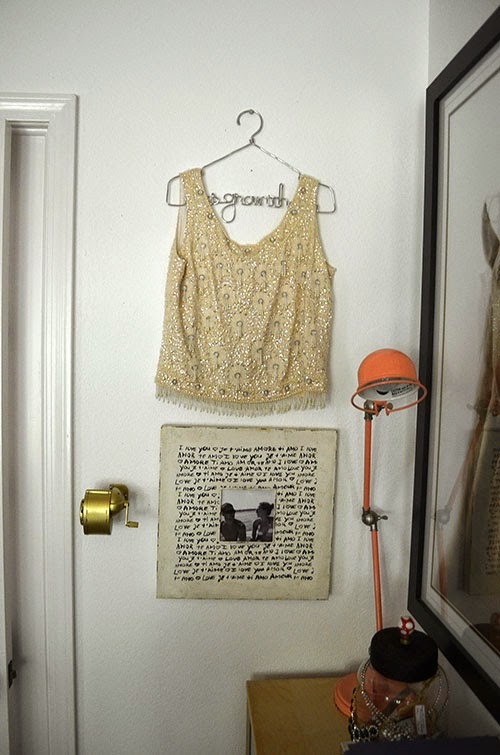 I saved that beloved pencil sharpener this entire time and finally spray painted it gold for this room makeover. Doesn't it look so glamorous next to the vintage beaded top my grandmother passed down to me? This rolling bookshelf is our "dog station" where we keep their food bowls, water bowl and all other pet paraphernalia. Perhaps not the prettiest, but extremely functional nonetheless. All in all, I am so thrilled with my new work space. It makes me so happy. 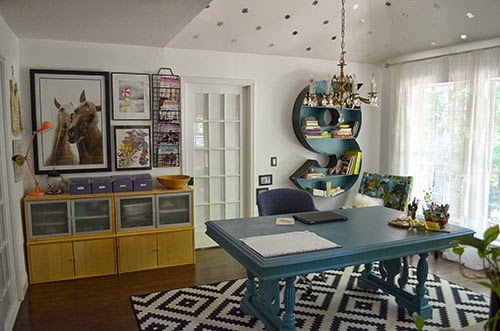 I work from home twice a week and do all my blogging/crafting/artwork in here, so I'm in this space a lot. It really brightens my workday to have a special space all to myself. It's a big upgrade from sitting at my kitchen counter. If you have any questions, hit me up in the comments! I thought about doing a source list, but there are so many small items and tiny details in this room. I'm happy to provide the source if you are interested in a specific item, although I will say that many are thrift store/flea market/DIY projects.